Telecom network equipment maker Nokia has kicked off a new cost-cutting program and repeated an ambitious profit forecast, saying operators' demand for next-generation 5G networks would pick up pace in the remainder of the year. The networks industry - dominated by Nokia, Sweden's Ericsson and China's Huawei - has been battered by years of slowing demand for existing 4G networks and mounting investor doubts over whether 5G contracts can begin to boost profitability this year. The Finnish firm, which also reported a drop in quarterly profit, said it was targeting annual cost savings of 700 million euros (US$799 million) by the end of 2020, without elaborating on the scale of expected job reductions. "We are making progress but still have more work to do get our network margins where we would like them to be," CEO Rajeev Suri told a conference call. 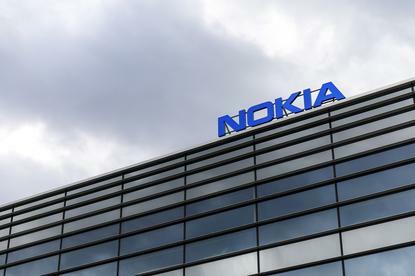 He reaffirmed an outlook for Nokia's networks business to deliver a full-year operating margin of six-nine per cent. The margin for the first nine months is only 2.6 per cent. "Despite some risks related to short-term delays in project timing and product deliveries, we remain on track to deliver on our full-year guidance," he added. As evidence of the 5G cycle taking root, Nokia in July signed a US$3.5 billion deal to supply U.S. mobile carrier T-Mobile with new network gear. Nokia's operating profit in the third quarter fell 27 per cent from a year ago to 487 million euros broadly in line with analysts' mean forecast in a Reuters poll of 492 million euros. The year-ago profit figure was boosted by a catch-up licensing payment. More than half of the earnings were generated by Nokia's highly profitable patent business, a legacy of Nokia's history as the market-leading mobile phone maker. Nokia also announced an extension to its patent license deal with Samsung on Thursday. Shares in the company fell one per cent in early trade. "Networks business sales is growing, which indicates that the market is picking up... I believe Q4 will be very strong," said Mikael Rautanen, an analyst at Inderes Equity Research, which has an "accumulate" rating on the stock. "But there is a small risk of a profit warning for the remainder of the year."